This fab new Tea Caddy is the perfect plastic free option to buy your tea, this one is filled with Apple Loves Mint, A layered flavour of sweet apple and papaya, followed by a subtle rose hint and finally fresh mint. 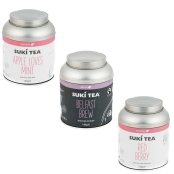 Plus you can keep your Suki Tea fresh with these brand new embossed Tea caddies, you can pop these on your shelf and refill them up again and again! This tin tea caddy is filled with 125g of Apple Loves Mint. This fruit tea is a beautiful tea on the eye, complete with rose buds (so cute). This mint based tea has Apple and playful papaya sweetness, a subtle hint of rose blossom, then a fresh mint finish. Caffeine Free & a well known favourite at Suki HQ! We're so proud of these tins - how pretty are they going to look in your home! Plus it's your plastic-free, refillable option! Under the pretty label, these brand new embossed tea caddies have our iconic sketches on them, perfect to pop up on your shelf and top up again and again, yes please! Have you got your KeepCup yet? Service rating : Service was very fast and efficient . The product arrived promptly and was in perfect order. Service rating : Always a prompt and reliable service. Have bought from them on various occasions and the service is always good.Plus the tea is great! Product : Very nice looking tea caddy, but having the lid in two sections that have to be taken off every time to get to the tea is a bit of a... Service rating : Always a prompt and reliable service. Have bought from them on various occasions and the service is always good.Plus the tea is great! Product : Very nice looking tea caddy, but having the lid in two sections that have to be taken off every time to get to the tea is a bit of a fiddle and the handle on the inner lid sometimes comes off. Service rating : Really efficient service, as always. An incorrect product was accidentally sent with the order [there were quite a few different teas ordered]. Mistakes happen and I was impressed in the way that the issue was sorted out quickly and efficiently. Very happy with the service... Service rating : Really efficient service, as always. Very happy with the service and the product. 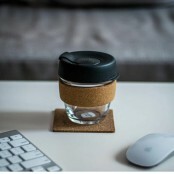 Product : Great way to store this tea. It is in the cupboard inpride of place. Service rating : everything from ease of ordering to prompt delivery . i am soon requesting another order. Product : tea caddies were a gift for my daughter she loved them.